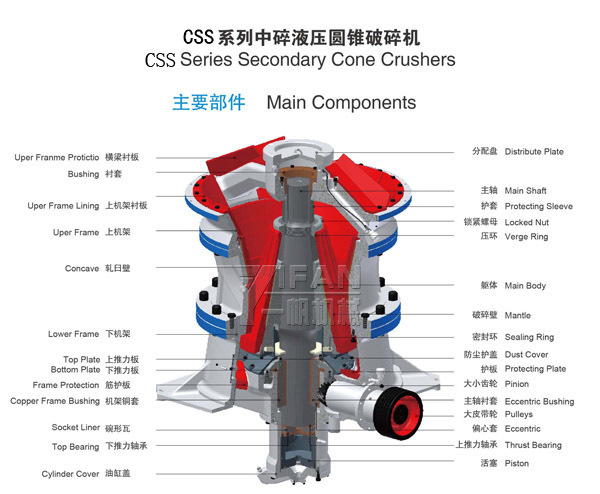 Having summarized all the advantage of each crushing cavity and experienced theoretical analysis and practical examination, CCS series hydraulic cone crusher designed by YIFAN engineers owns variety of cavities for your choice. Through selecting suitable cavities and eccentricity, we can do our utmost to meet our customer’s different requirements and realize high capacity. Laminated crushing function can be fully realized with full realized with full load, which contributes to good shape of final product with more cubic particles. CCS single-cylinder hydraulic cone crushers gets to world advanced level, which is designed and made through absorbing world advanced crushing technology. It is widely used in metallurgical, aggregate, building material industries. It is suitable for crushing varies of hard and above mid hard ores and rocks.